There was a point in time where one of the only places you saw pumpkin was in pumpkin pie, but those days are long gone. Pumpkin – and pumpkin pie spice, of course – is all over the place during the fall, in desserts, savory dishes and even in coffee drinks. 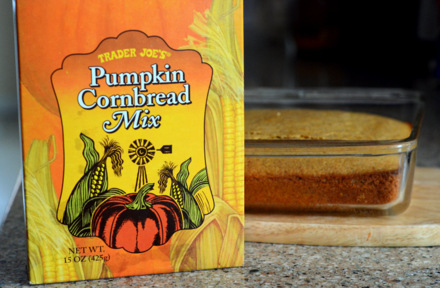 My Homemade Pumpkin Cornbread is just one of many delicious ways to use pumpkin that is a little bit outside the box! It is also a great way to use up a relatively small quantity of leftover pumpkin puree that you might have on hand after baking some muffins or other pumpkin baked goods. The cornbread is an easy to make quick bread with a hearty texture, thanks to the fact that it uses more cornmeal than flour in the batter. This bread has a hint of sweetness to it, but it is far from a sweet bread. 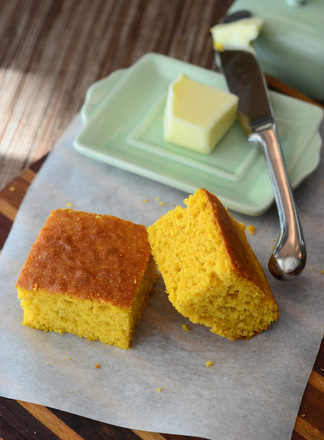 You can definitely smell the natural sweetness of the pumpkin while the bread is baking, but the dominant flavor in the finished cornbread is corn, so even the pumpkin-averse in your family will be able to enjoy it. The bread is quite moist and very light, with a coarse – yet pleasant – texture from the cornmeal. It is versatile enough to pair with savory dishes – like your Thanksgiving dinner – and to be slathered with butter and honey for breakfast. The bread is best on the day it is baked, though it actually can be kept for a day or two when stored in an airtight container. When it is fresh, the top “crust” gives you the perfect contrast with the moist center of the bread. It is just delicious when spread with some softened, salted butter when it is still slightly warm from the oven. Since the corn bread does not take long to mix up or to bake, you can easily whip this up on a weeknight or at the last minute during a holiday dinner for an extra side dish. Preheat oven to 350F. Lightly grease an 8-inch square baking pan. In a large bowl, whisk together flour, cornmeal, baking powder, baking soda, salt and sugar. In a medium bowl, whisk together milk, pumpkin puree, eggs and vegetable oil until smooth. Pour pumpkin mixture into the flour mixture and whisk until just combined. Pour batter into prepared pan. 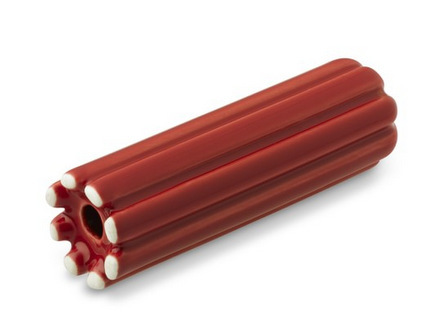 Bake for about 30-35 minutes, or until a toothpick comes out clean and the bread springs back when lightly pressed. 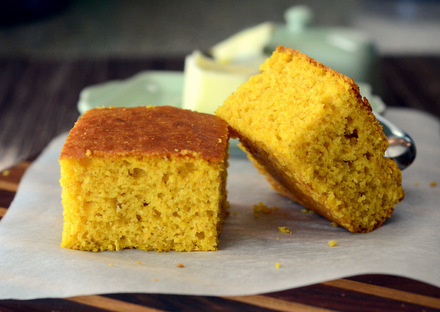 Could you cook this in a cast iron skillet, like a southern cornbread? Kyrsta – Yes, absolutely. A 9-inch skillet will give you about the same baking time. A smaller skillet will create a deeper bread and may need a couple of additional minutes of baking time.